Sonja Grossner s HUMORESQUE is a short, light piece being performed in the version for chamber orchestra. 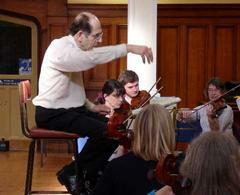 Performed by the University of Leicester Sinfonia under Michael Sackin. The same forces performed an earlier version of the work a couple of years ago.